Photo by Bryan Stevens A female Common Yellowthroat entertained bird walk attendees as she foraged among Joe-Pye Weed in the butterfly garden at Sycamore Shoals State Historic Park. It’s funny how you can go most of the year without seeing a certain bird. Then, the drought ends and you enjoy a spike in the numbers of sighting within a short amount of time. A female Common Yellowthroat became a highlight of the first of this year’s October bird walks at Sycamore Shoals State Historic Park, which was well attended with nine participants. The bird was foraging in the flower heads of Joe-Pye Weed in the butterfly garden at the park. The Elizabethton Bird Club has offered these hikes for more than a decade at the park. Prior to conducting the walks at Sycamore Shoals, the club also led October hikes at Winged Deer Park in Johnson City and along the linear walking trail in Erwin. Photo by Bryan Stevens A portion of the flock of 104 Blue-winged Teal found on the first of this year’s October Saturday Bird Walks. Tess Cumbie, a former resident of Buladean, N.C., came up with the idea for the walks back in the late 1990s. The first of this year’s walks at Sycamore Shoals took place on Saturday, Oct. 4. 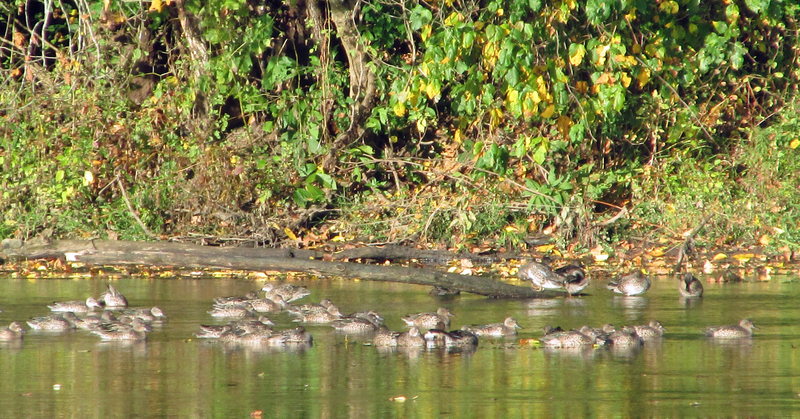 A raft of 104 Blue-winged Teal on the Watauga River ranked as another highlight of that morning’s bird walk. Pied-billed Grebes, Mallards, Wood Ducks and Canada Geese were also present on the river. Photo by Bryan Stevens A Maple Spanworm Moth warms itself during the chilly morning bird walk. Other birds found included Black Vulture, Turkey Vulture, Chimney Swift, Red-bellied Woodpecker, Yellow-bellied Sapsucker, Downy Woodpecker, Northern Flicker, Eastern Wood-Pewee, Blue Jay, American Crow, Carolina Chickadee, Tufted Titmouse, Carolina Wren, Eastern Bluebird, Swainson’s Thrush, American Robin, Gray Catbird, European Starling, Cedar Waxwing, Magnolia Warbler, Song Sparrow, Northern Cardinal, Rose-breasted Grosbeak, Indigo Bunting, Eastern Meadowlark, House Finch and American Goldfinch. When not looking at birds, participants enjoyed diversions such as the Maple Spanworm Moth blending with the fallen leaves on the gravel walking trails. 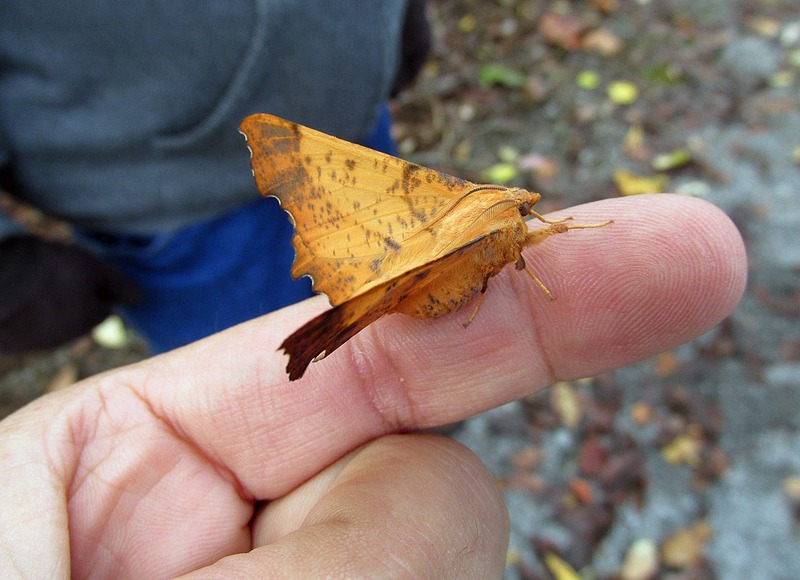 I had never seen this particular moth, which spent some time warming itself on one of my fingers. Although well attended by participants from as far as Abingdon, Va., the weather that greeted us was quite frigid. The cold appeared to bother us more than it affected the birds. A male Wood Duck landed, briefly, on the fish pond on the morning of Oct. 5. If I hadn’t been outdoors at the time, he might have stayed longer. When I moved, he flew. It’s the first visit here at home from a Wood Duck in several years. Coincidentally, the last visit also took place in early October. Photo by Bryan Stevens This densely-planted flower bed on the ETSU campus provided cover for a migrating Common Yellowthroat. I am beginning to find that the campus at East Tennessee State University can produce some fun bird sightings. After witnessing a Cooper’s Hawk nearly catch a squirrel from the top branches of a tall tree near Gilbreath Hall, I have been paying closer attention to those feathered friends that visit the campus. 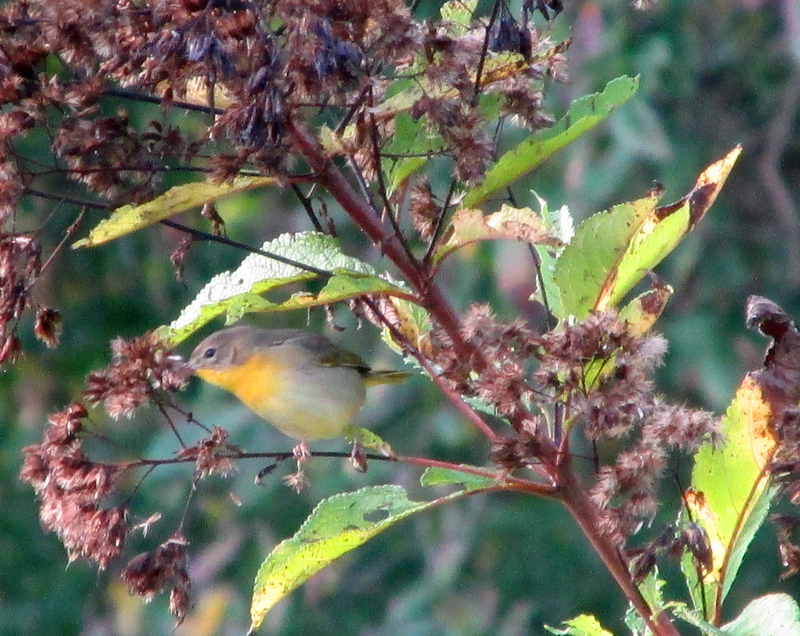 During a Sunday evening stroll on Oct. 6, I found a Common Yellowthroat in a well-planted flower bed. So, I have added my first warbler to my ETSU list. I also saw a Red-bellied Woodpecker flying over the Culp Center during the same walk. 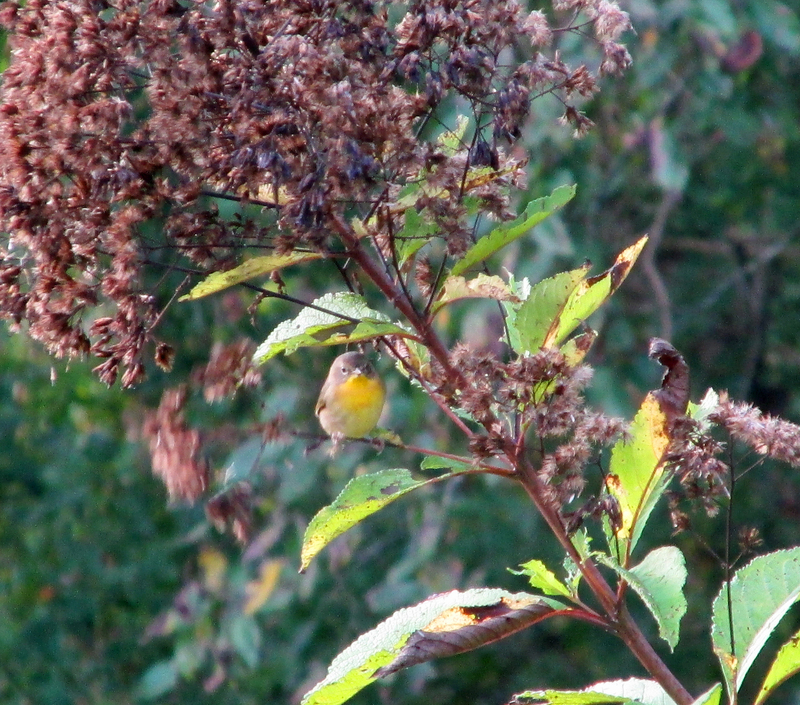 It also got me to thinking about how many Common Yellowthroats I have been seeing this fall. When I posted about the sighting on Facebook, Cathy Myers commented and informed me that she had recently observed a Rose-breasted Grosbeak on the campus. Photo by Bryan Stevens Gray Catbirds, such as this one, have been found on the first of the Saturday Bird Walks this October at Sycamore Shoals. At the second of the four Saturday Bird Walks scheduled this October, rain threatened to impede the stroll. Fortunately, the showers held off until after the walk on Oct. 11 concluded at about 9:30 a.m. The second of the October Saturday Bird Walks produced several highlights, including a duel between an Osprey and an adult Bald Eagle over the Watauga River, as well as four species of warblers — Tennessee, Bay-breasted, Palm and Yellow-rumped — and other birds, including Chimney Swift, Mockingbird, Starling, Northern Flicker, Blue Jay, Carolina Wren, Mourning Dove, Eastern Bluebird, Mallard, Carolina Chickadee, Canada Goose, Goldfinch, Red-tailed Hawk, Red-bellied Woodpecker, Crow, Yellow-bellied Sapsucker, American Robin, Northern Cardinal, Song Sparrow and Downy Woodpecker. Although we had fewer participants on this walk, we enjoyed better observations of the birds. One exciting moment involved the flock of irate Blue Jays gathered to scold a Red-tailed Hawk that had flown too close for comfort. Two more Saturday Bird Walks remain during October. They will be held on Oct. 18 and Oct. 25. The public is welcome to these free strolls along the walking trails at Sycamore Shoals State Historic Park. Bring binoculars to increase your viewing enjoyment. Photo by U.S. Fish & Wildlife Service A male Common Yellowthroat surveys his surroundings from a prominent perch. 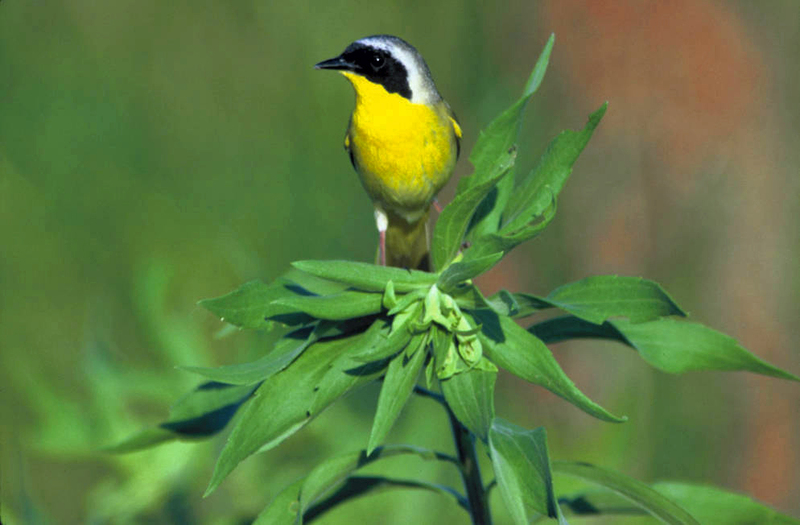 The Common Yellowthroat is a warbler that is quite fond of weedy, damp habitats. Marshes and other wetlands are preferred habitat during the nesting season, although a few of these birds are also present in more dry habitats. In migration, any weedy corner might attract one of these warblers. 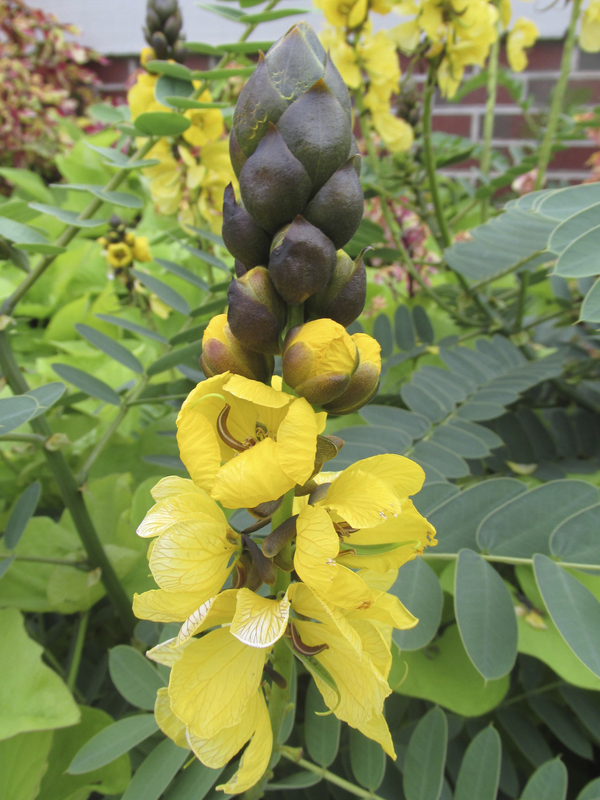 In fact, the one I found on the ETSU campus remained elusive in a raised concrete bed containing a thick planting of flowers and shrubs. 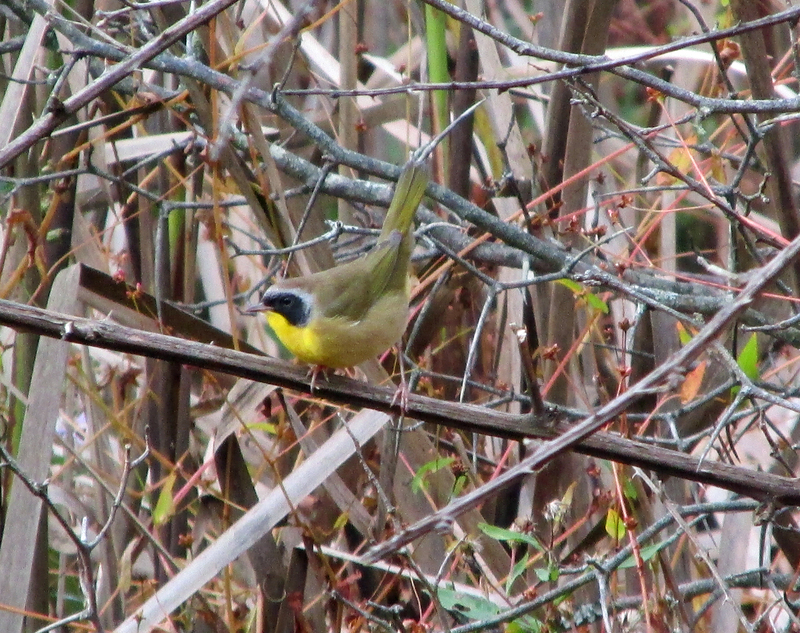 A male Common Yellowthroat visits an overgrown thicket during fall migration. The Common Yellowthroat belongs to the genus of warblers known as Geothlypis, which also includes the related Bahama Yellowthroat, Hooded Yellowthroat, Masked Yellowthroat, Black-polled Yellowthroat and Gray-crowned Yellowthroat. These other species are found in Central and South America, as well as the Caribbean. 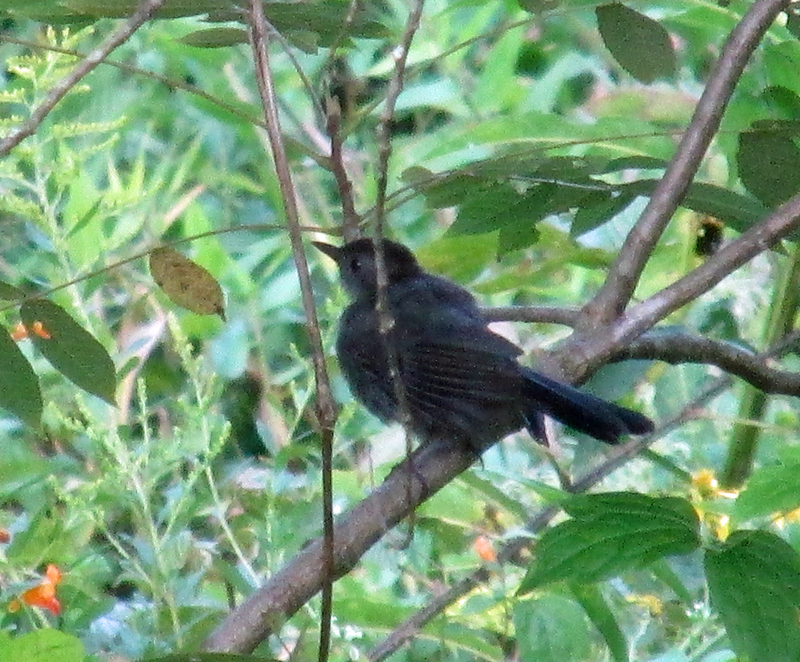 Recent classification of the Geothlypis warblers has led to the inclusion of three other warblers — MacGillivray’s, Mourning and Kentucky — being shuffled into this genus. Photo by Bryan Stevens The female Common Yellowthroat lacks the male’s black face mask. Male and female yellowthroats show a bright, yellow throat. Males also sport a black mask bordered with a silvery-white line, and the male’s throat is usually a brighter yellow. Although males will sing in the open during the nesting season, these birds usually prefer to remain hidden from view as they go about their daily routines. 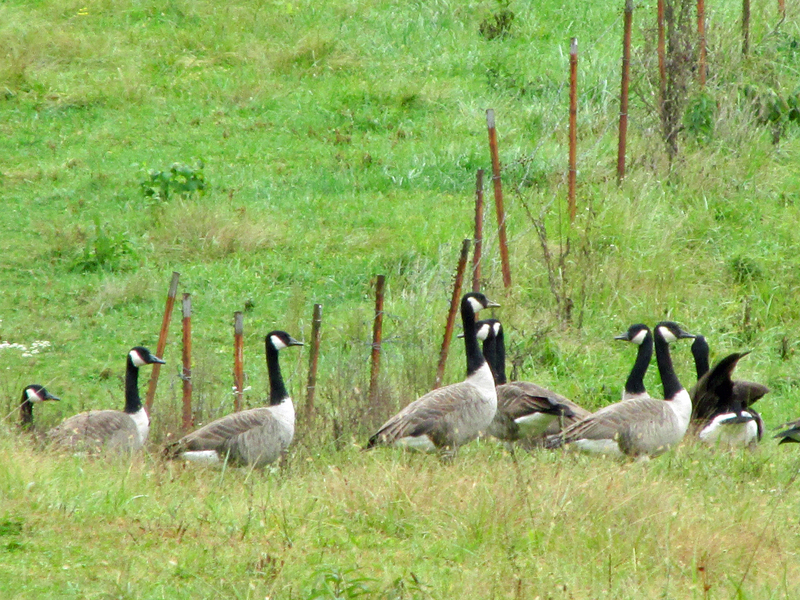 Photo by Bryan Stevens A flock of Canada Geese forage in a field near the Bell Cemetery in the Limestone Cove community of Unicoi County on a recent October afternoon. This entry was posted in Birding, Birds, Carter County Compass, Elizabethton Star, Erwin Record, Fall migration, Our Fine Feathered Friends, Rose-breasted Grosbeak, Warblers and tagged Birding, Blue-winged Teal, Carter County Compass, Common Yellowthroat, Elizabethton Star, Sycamore Shoals State Historic Park, warblers on October 12, 2014 by Bryan Stevens.